Home Workwear Winter Workwear: What are your Options? Winter Workwear: What are your Options? Wouldn’t it be nice if, when the weather gets cold, we could all just head inside and take a nice little vacation until spring? Of course it would. But you live in the real world. So when you need to work outdoors during the winter months, make sure you’re properly equipped to handle the weather. Having the best winter workwear on the job during the cold months is good for your comfort, your protection, and your productivity. 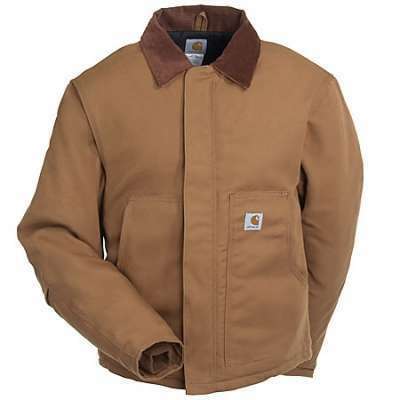 The leading manufacturers of winter work clothes, like Carhartt, Wrangler, Wigwam, Filson, Stormy Kromer and more, make their pants, shirts, coats, jackets, boots, gloves, hats and other products out of a number of different fabrics, for a number of different uses. Different fabrics have different advantages, and oftentimes, there are different insulations that you can utilize as well, to maximize your comfort and protection during the winter months when you are working outdoors. The most popular winter workwear fabric is cotton duck because it is weighty and strong. Since it is incredibly resistant to tearing, and holds up great during rough wear, it is an ideal fabric for the job site. And since it is so good at protecting you from the elements, it is an ideal fabric to wear in the winter. Cotton duck is second only to leather when it comes to its ability block out the wind, which is especially important on a cold, blustery winter day. Denim is not quite as durable as duck, but it is another popular option when it comes to winter workwear.Whether you’re wearing denim jeans, or a jean jacket, denim is pretty sturdy material that will stand up to a rugged workday, but it is also pretty comfortable and flexible. And it is good at keeping out the elements like snow, ice, and wind, helping you stay dry and warm. Another long-time favorite winter fabric is flannel, since it is very warm, very comfortable, and also rather inexpensive. Flannel shirts are awfully tough to beat during the winter months due to their ability to trap in warmth. Since layering your work clothes is a great way to stay warm in the winter, flannel shirts are a great option for the underneath layer since they are so soft and feel good against your skin. Leather is used in boots, gloves, jackets and several other winter workwear products because it’s tough to beat leather when it comes to durability, pliability, and protectiveness. There are a number of different types of leather that offer great protection and warmth on a cold winter day at work. Traditional leather is the most popular choice, but options like deerskin and elkskin are both incredibly tough and having great stretching abilities, which make them a particularly popular option for winter work gloves. Additionally, there are a number of synthetic fabrics such as nylon, polyester, GoreTex, Cordura and more, which combine many of these warmth, comfort, and durability properties. For instance, GoreTex is great at being warm and waterproof, which is especially important in the winter. Cordura is a type of nylon that is especially effective at blocking out wind and water. In fact, there are many products that are specifically made for being worn during work in cold, winter weather. Insulations and linings are a really effective way to stay warm and dry at work in the winter. Blanket and flannel linings use cotton, wool, or acrylic fabric, sewn into the inside of pants or shirts. One of the most popular versions of this is flannel-lined denim jeans. Fleece linings work in much the same way, using polyester fleece; it is a soft, comfortable fabric lined along the inside of outerwear — like a coat or snow pants — which provide insulation and pull moisture (like sweat) away from your body, keeping you warm and dry. Quilted linings take synthetic fabric, and stitch it over insulating fill such as polyester or down, basically trapping the warmth-preserving materials against the fabric of the garment, for added warmth. Sometimes, these linings and insulations are used in tandem, such as a coat that has a fleece lining in the chest, and a flannel or quilted lining in the sleeves. Whatever option you choose, taking steps to wear the right kind of winter workwear will make sure you stay warm and comfortable in the winter. You need to protect your body from the elements and Working Person’s Store has a great selection of winter clothing products that will make you ready for whatever weather the work day brings. Previous articleBe Prepared for an Early Winter!